Maria Barile, speaking at the June 19th press conference. July 26, 2013 (Montréal) – It is with profound sadness that we learned about Maria Barile’s death on the night of July 24th at Sacré-Cœur hospital at the age of 59. 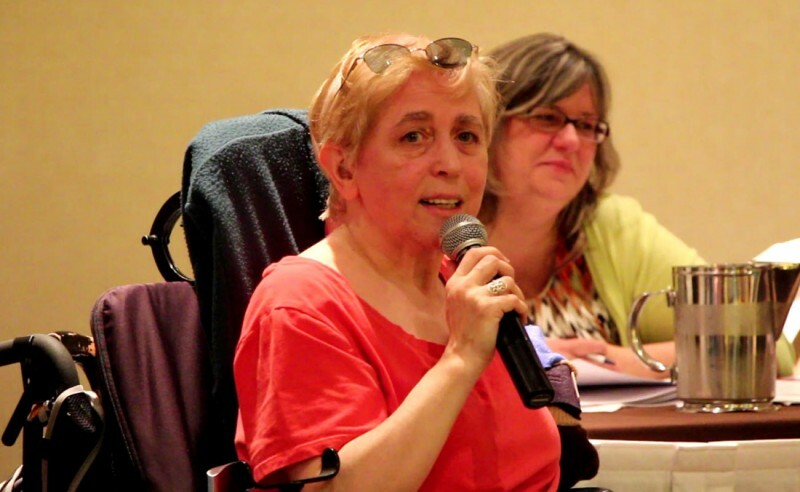 She was a major icon within the women’s rights movement and disability rights movement in Quebec and Canada. Among the concrete changes she made were co-founding the DisAbled Women’s Network of Canada – DAWN-RAFH Canada – as well as being a co-founder of Action des femmes handicapées (Montréal) over 26 years ago; two institutions by and for women with disabilities to which she was passionately dedicated. Visitation services for family and friends will be on Monday, July 29th at 3955 Cote-de-Liesse from 2:00pm to 7:00pm. RAPLIQ pays tribute to Maria Barile. Action des femmes handicapées Montréal (AFHM)’s profile of Maria. Interview on CBC radio with Laurence Parent from RAPLIQ speaking about Maria Barile’s powerful role as a disability rights activist.